Ducati’s further development of the Pantah engine saw the introduction of a 750cc version emerge in the mid 1980’s, the most notable being the highly desirable 750 F1 introduced in 1985. The intricate frame design based on the successful TT1 / TT2 race bikes. 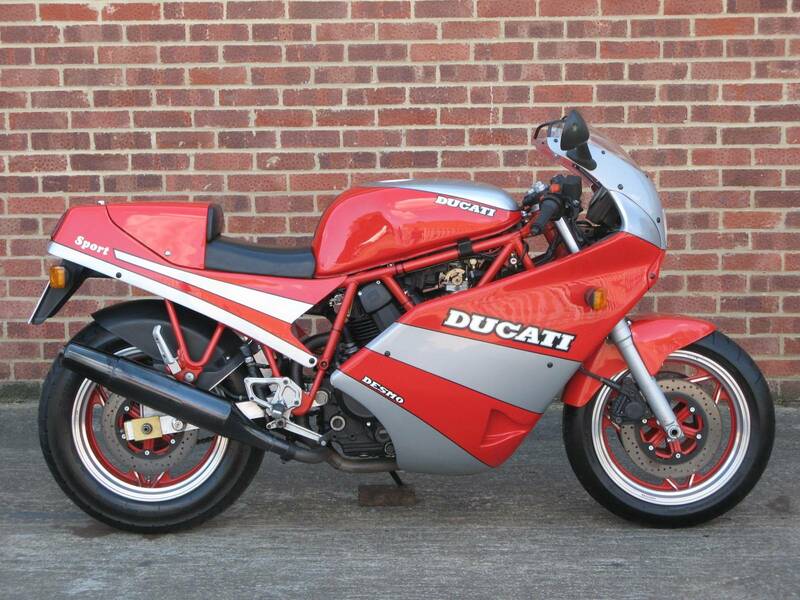 These were among the first bikes to carry the new elephant logo, a symbol of the take over of Ducati by Cagiva. The slightly less radical 750 Sport was introduced in 1989 but only stayed in production until 1990. Basically the same frame but modified in the front to receive the massive ‘car’ type Weber 44DNCF carb and air filter. With 16” wheels and Marzocchi suspension all round the bike was praised for its handling, it has a 50-50 unladen weight distribution. The riding position is not as harsh as the F1 particularly the footpegs , making it more comfortable and easier to access the 5 speed gearbox, and at less than half the current value of an F1 it has to be the best value variants and one of the rarest. This example registered in 1991 was recently imported from Germany, a very well maintained bike the carb was recently overhauled and the bike fully serviced. Showing 34,500 kms ( 21,500 miles ) the bike remains in very good general order, a small slight dent in the rear of the tank and a few tiny paint blemishes being the only noticeable marks, the original exhausts are in good condition. The bike sounds and rides great and has a UK MoT until April 2018, UK registration has been applied for.